With Thanksgiving only a week away, I’ve been busy planning our menu to include all of our traditional dishes, along with a few new faves! We’ll have turkey, of course, with some sort of mashed potatoes, and since we’re already having potatoes, I’ve put a twist on sweet potato casserole using butternut squash instead! And it’s made even better because this casserole is topped with simple, 3-ingredient maple candied pecans—talk about yum! You won’t even miss sweet potatoes in this yummy variation. I used Taylor Farms Butternut Squash, which is convenient because it’s washed, peeled, and ready to use—saving on prep work is a MUST on Thanksgiving! Not only is butternut squash delicious, it’s also a nutritional powerhouse, chock-full of carotenoids, vitamins A & C, with plenty of fiber and potassium as well. It’s a great way to include an extra veggie at the table too, though it’ll be disguised as a dessert-like treat! 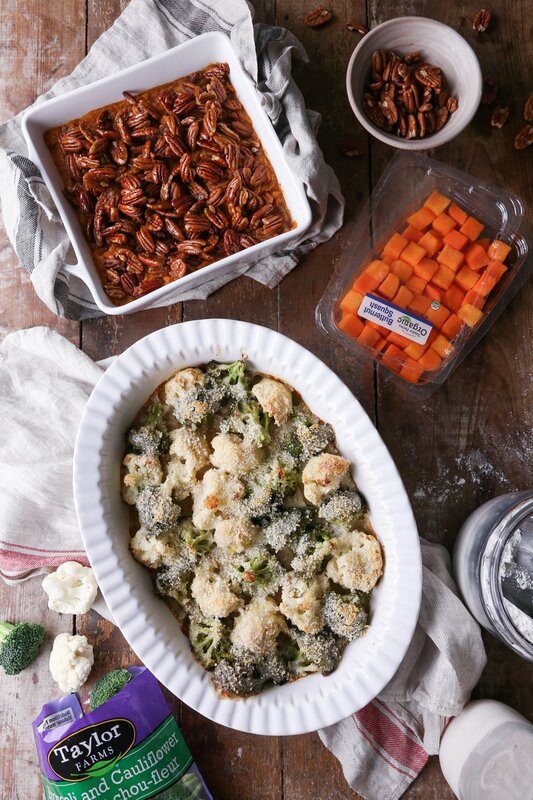 Speaking of veggies, this broccoli & cauliflower gratin is another side that will definitely be on our Thanksgiving table this year! Move over green bean casserole, there’s now a new favorite green veggie dish in our family! This gratin is made even more simple using pre-washed and cut bags of Taylor Farms Broccoli and Cauliflower medley. You literally just empty the bag into a pan and stick it in the oven while you make the béchamel sauce. I’m telling you, it’s crazy simple and SO good! We’ve made this gratin several times in the past few weeks and there’s never any left over, which is always a great sign! The kids got second and third helpings of veggies too—it was unbelievable! Find the easy recipe for both side dishes below! Preheat oven to 450ºF. Place broccoli and cauliflower into a 9×13-inch(ish) oven-safe baking dish. Cut or break any large florets into smaller pieces. Sprinkle with salt and pepper and place into the oven to dry roast for 15 minutes, while you make the béchamel. Meanwhile, heat 1 3/4 cup milk and butter in a saucepan over medium heat. Whisk together remaining 1/4 cup milk and cornstarch. When milk is heated, add the cornstarch slurry to the pot, stirring continuously until thickened. Reduce heat to low and if you’re adding cheese, add it in now, along with salt and pepper, to taste. Remove broccoli and cauliflower from the oven and reduce heat to 350ºF. Pour béchamel over the roasted veggies and top with bread crumbs. If you’re grain/gluten–free, you can omit the bread crumbs, use a gluten-free variation, or use a handful of grated parmesan cheese in its place. Place back into the oven to bake until hot and bubbly, and top is lightly brown, about 30 minutes. Serve right away. Finding ways to cut prep time in the kitchen is key on Thanksgiving day, that’s why I love using Taylor Farms ready-to-use vegetables, which truly saves SO much time when you don’t have to wash, peel, and chop these veggies. And less time in the kitchen means more time with family and friends…and let’s be real—more time shopping! I hope you enjoy these sides as much as our family does! Happy Thanksgiving! This delicious take on sweet potato casserole uses butternut squash as the star! It's a super simple side which is free of gluten, dairy, grains, eggs, and refined sugar! Strain, pressing out any additional water, and continue to let sit in the colander to drain while you prepare the pecan topping. Squeeze excess water out of the squash and then transfer to a large mixing bowl. Add butter, 3–4 tablespoons syrup (to taste), cinnamon (to taste), and generous pinch of salt (add less if your butter is salted.) Beat mixture with a hand mixer or mash with potato masher until no clumps remain. Transfer mixture to and 8-inch square or round baking pan and top evenly with maple pecans. Place into the oven and bake until hot and bubbly, about 30–40 minutes. Makes about 8–10 servings. Casserole can be assembled, without topping, up to 2 days ahead of time, covered and refriegrated. Candied pecans can be made 2 days ahead; store in an airtight container at room temperature. Drain off any excess liquid that may have gathered on top of the squash before topping with pecans and baking. Beautiful dishes and so perfect for Thanksgiving! This looks so darn yummy! I am definitely going to try this recipe! And your photos are phenomenal girl, keep it up! Oh you had me at maple pecan! Omg how scrumptious does that look. I am def giving this a go for thanksgiving. Yum! Oh my goodness, these dishes look absolutely mouthwatering! I don’t want to wait till Thanksgiving, I want to eat these now lol. I was in need of two veggie dishes this year for Thanksgiving. Both of these are new to me. Love the cheese sauce idea. Your recipes look scrumptious! I’ve never tried butternut squash in a sweet recipe but it sounds delicious! Can I just come to your house for Thanksgiving?? All these dishes look amazing. I’m even in love with the way you set up the table. Thank you I really appreciate the love! Have a lovely evening! holy smokes these both look so good! I am so pinning this to make for the holidays! Aw thanks Kara! I appreciate the kindness! These are making me super hungry! They all look so yummy! Sometimes am impressed by the creativity of some people’s recipes.